It is common for small boats to be caught offshore in squalls or storms. Greater fuel capacity and modern engines allow them to venture well offshore without fear of having enough fuel to make port. An item normally found on sailboats and trawlers but seldom on small pleasure crafts is a sea anchor. A Sea Anchor is a conical shaped device that, when properly deployed and of the proper size, will hold a vessels bow to the sea and reduce the danger of broaching. A sea anchor will not hold your boat in place but it will hold your vessels bow to the seas until help arrives or you are able to complete repairs to allow you to get underway. Once deployed it should be set to ride just below the surface, on a wave ahead. When on the crest of a wave, the sea anchor should be on the crest of the next forward wave. Depending on the distance between waves, you may get a smoother ride with the sea anchor 2 or 3 waves ahead of your position. 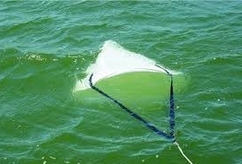 You must use a trip line (release line) when using a sea anchor. It is attached to the apex of the anchor and is used to dump the sea anchor and allows it to be retrieved backwards. The line is smaller in size, usually equipped with a float or two, and it must be longer than the main rode. The main rode of the anchor should be at least 10 to 15 times the length of your boat. Use of chain at either end of the rode will allow the nylon line between the chains to stretch and act as a shock absorber in the pull of the sea anchor. When you put a sea anchor aboard, test the distance that is most comfortable and try positioning it on various bow cleats. You may wish to use a bridle at the bow to fasten it. If you practice with it a few times, you will know the easiest and fastest way to deploy it should the need arise. If you are caught offshore in heavy seas and do not have a sea anchor, try tying a bucket, canvas bag or any object that will float just below the surface to a line fixed to your bow. It may act as a makeshift sea anchor long enough to help steady your vessel until conditions improve. First time I’ve seen a sea anchor suggested for small non-sailing pleasure craft. Not a bad idea to have one onboard if you’re going offshore or out in rough conditions, but practice its’ use before you need it so you know how to deploy and retrieve it. 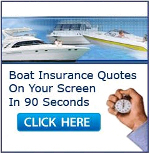 Also, don’t forget there are many other heavy weather tactics available, particularly if you’re on a sailboat.